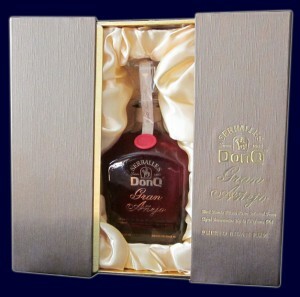 Don Q Rum, named for the windmill-slaying Don Quixote, boasts a commendable line of standard and flavored rums, with Gran Anejo being their flagship, top-of-the-shelf label. The packaging alone is a spectacle – a lovely, squarish glass bottle housed in a golden, satin-lined box that remarkably slides open from the center. But the fun doesn’t end there, as the bottle’s glass stopper is hollowed out in such a way as to measure out a shot for you – a bit gimmicky, sure, but so spiffy that I just can’t find it in my heart to criticize. The rum inside is a straightforward amber, and to the nose smells of cane and bananas. On the tongue you’re quickly met with a profound tingle. As the rum settle in your mouth this is replaced with a sweet creaminess. And on swallowing the finish lingers a remarkably long time, beginning gently and then building strength over the next several moments – a rum that keeps on giving. Don Q Gran Anejo isn’t exactly the sort of rum that scalawags would slug from their cracked mugs, but does nicely showcase the higher end, gentler flavor profiles so popular these days amongst the more “genteel” rum enthusiasts. 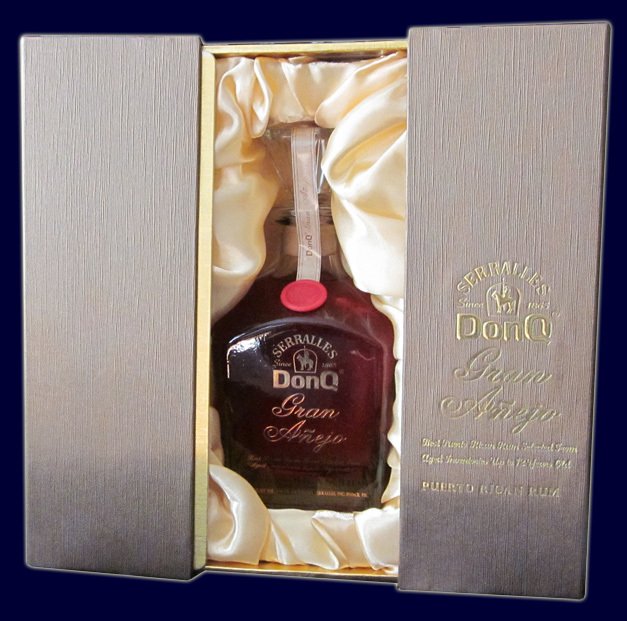 This entry was posted in Rum and tagged amber rum, don q, sipping rum by Bilgemunky. Bookmark the permalink.